"Charlotte has spent her twenties adrift, floating from interest to interest, job to job, and guy to guy, searching for a spark but never quite finding it. All she knows is that she won’t discover it working as a waitress at a pies-and-fries joint in Los Angeles or living with her fun but aimless best friend in a tiny apartment in the Arts District. Months later, Charlotte hasn’t been able to shake Adam, so she decides to find out what happened the morning after their magical night together. This fateful decision rewrites their wild love story, but what Charlotte doesn’t know yet is that the ending has already been written. " 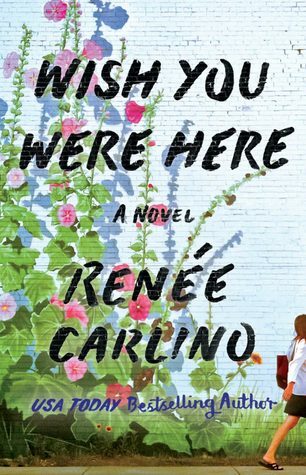 Thoughts: Is it just me or does Renee Carlino write some of the most addicting novels (blog pun not intended) known to man? All I have to do is crack one of her babies open and BAM, I'm sucked into the world. They're addicting to the point where I'm blocking out the infant crying in my lap and attempting my best to live in her books for as long as I can. WISH YOU WERE HERE is no exception to this rule. Like all of her books, left me questioning certain aspects of my life and wanting to live it to its fullest extent. This one had me doing it even more so. Let's chat. One night stand or soulmate? Charlotte isn't the type of girl to just sleep with anyone. She's the type of girl who is constantly trying to find her niche in this world. This makes her completely relatable. Who, regardless of your age, hasn't gone from job to job, major to major, trying to figure out if this is what we're meant to do? Heck, I still do it now! At any rate, after another torturous day swinging soup around, Charlotte's friend Helen convinces her to go out for some drinks and after helping a drunk Helen home, they run into Adam. He seems lost, possibly new to the neighborhood, so Charlotte tries to help him out. The connection between the two is instant, and with one final push from Helen, Charlotte decides to take a leap of faith. The night seemed perfect, things fairy tales are made of. Sadly, the night cannot last forever and come the next day, Adam seems to have morphed into someone different. What happened? Why the cold shoulder? Months pass, and Charlotte cannot get Adam out of her mind. These types of fiery attractions don't come very often, so Charlotte decides to track Adam down. This is when the real story starts. I can't say too much without giving the general story away, but I will say this: WISH YOU WERE HERE will take you on a fantastic journey that will have you wishing for your own Adam. He's hilarious and full of life, and he has the type of personality you can't help but love. There will be moments where you will be questioning his actions, but like all of Carlino's guys, he really, truly has a good heart. Gosh, I've literally fallen for every single one of her male leads. She sure knows how to write them! If Adam doesn't have you falling in love with this book, Charlotte will. I loved how involved her family was in her life, how much her friends loved her, and how much she loves in return. There are not enough Charlottes in this world. Overall, I truly loved this book and believe others will, too. There are definitely books I would compare this one to, but I feel like people will look too much into it, so (for spoilers sake) I'm just not going to. You're welcome to find me on Twitter (Lena1xoxo), DM me and ask, but for now just know it's up there with some great ones. Hello good people. have a nice day. Hello good people. have a nice day.. YESSS!!! This sounds fantastic! I love meet-cute stories, and hopefully there's not a whole lot of insta-love in this one. But it sounds lovely, and I'm looking forward to meeting the characters in the future. I admit to not having read any of this author's books yet, but I'd like to read this one first! I don't read much NA, but I'm at the right age for this. Hello good people. have a nice day. good website!! Bạn có thể dễ dàng truy cập vào cá cược trực tuyến để tham gia khi bị nhà mạng chặn thông qua rất nhiều đường link mà nhà cái bóng đá fun88.com cung cấp, đảm bảo lúc nào cũng có thể truy cập ổn định không bị gián đoạn. Link Fun88 nhà cái cá cược thể thao lớn nhất Việt Nam và thế giới. Người chơi sẽ được chơi cá cược cùng với Rút tiền Fun88 cùng với đó là những trò chơi poker đánh bài casino trực tuyến giao diện đẹp mắt không tốn bất kỳ chi phí nào.